If you’re looking for ESL Textbooks for Kids you’ve come to the right place. I taught kids in Korea for years and have seen most of the textbooks and then seen them again. There are certainly some great ESL textbooks for children out there. And then there are certainly some truly terrible ones. As teachers, we all know that a great ESL textbook can make a class. You can have a great lesson with minimal prep by just following along with the book. On the other hand, a terrible ESL textbook can break you. You’ll open up the book, see that’s there’s nothing really of substance and then have to try to make it work. Perhaps you just soldier through the material, but the kids hate it. Or, you waste a ton of time making up all sorts of supplementary games and activities to make it interesting. Neither are a great option. Here are some of my favourite ESL textbooks for children. Make your class a success! 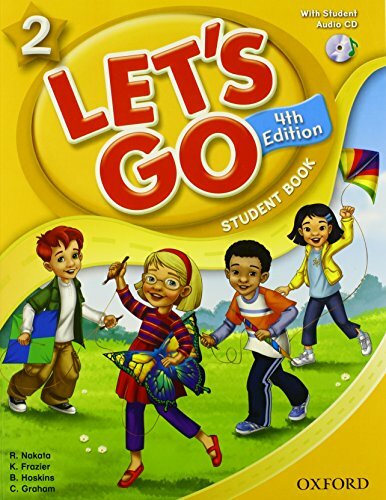 Let’s Go is an excellent choice for teaching children English as a second or foreign language. It’s one of my favourite ESL textbooks for children. It’s recommended for ages 5-11 or 12, similar to elementary school age children in the USA or Canada. Unlike other ESL books for kids, each page contains some actual content and not just pictures as fillers. However, the book has only one main idea/page so it’s easy to teach and it doesn’t get confusing for your students. There is also a distinct lack of fluffy colouring pages. Actual things to teach? Love it! When you teach children, it’s best to not power through page after page of material (actually, that’s the same for adults too!). It’s better to go slowly and let vocabulary and grammar sink in. After all, you want your students to be able to remember the content. I found that two pages in a 45 minute-1 hour class works great with this book. However, be prepared to supplement with plenty of ESL Games and Activities. The Let’s Go Teacher’s Guide as well as cards are an excellent resource to help you plan your lesson and give you some materials to practice with (mentioned below). Be sure to get the Let’s Go 1 Teacher’s Book and Let’s Go 1 Teacher Cards that go along with this excellent ESL textbook for kids. New Parade is a 7-level series for young children that contains a nice mix of TPR (total physical response), songs, pair work, cooperative learning and some hands-on, craft kind of activities. It does a good job of mixing in some fun activities with some actual content. I find that the vocabulary are very appropriate for young children and they’re learning what they’re interested in at that age. Children seem to enjoy it and there is also a New Parade Workbook that has some very age-appropriate homework activities. It definitely belongs on any list of best ESL textbooks for children. 501 Riddles and Trivia Questions: For Teachers of Kids (7-13) is the book you need if you teach elementary school students. While not an ESL Textbook for children, it’s a great resource to keep in your back pocket to pull out in case of emergency-a few minutes of dead time at the end of class. You can also use these riddles for kids as a warm-up. Another idea is to print off the PDF handouts to use as early-finisher tasks, or group-work. Finally, you can also use them to teach kids about how to do Internet research. It really is the book that belongs in your personal library if you teach elementary age children, ESL/EFL or not! If you’re looking for some game or activity ideas to supplement a textbook, 39 No-Prep/Low-Prep ESL Speaking Activities: For Kids (7+) is the book you need in your library. The activities are fun, engaging and easy to prepare. Guaranteed to make your teaching life easier and lesson planning faster. Although it’s not an ESL textbook for children, it does contain a ton of low-prep or no-prep ESL games and ESL Activities for kids. You can use this to supplement your main textbook and the best part about it is that most of the games and activities can suit any sort of vocabulary or grammar lesson. Just adapt a little bit and go! What is the best 4-skills, ESL textbook for kids these days? Leave a comment below and tell us what you think.